This month Our Daily Bread Designs is releasing some beautiful Fall and Christmas Theme sets, you can see all of the October Releases here. Continue reading below to find out how you can win a $50 Gift Certificate to the ODBD Store good towards the purchase of ODBD stamps. 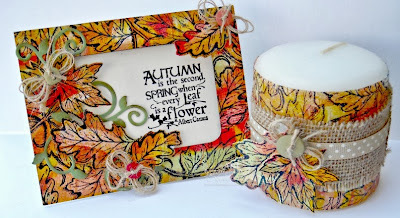 I created some Fall home decor projects (small frame and stamped candle) using Our Daily Bread Designs Autumn Blessings and Leaves Background stamp sets. Not having papers in the colors I wanted to use for my projects, I created my own backgrounds, using Acrylic Paints, Just a Trace Stencils and a Gelli Arts Plate. Instead of using Tissue Paper to wrap my stamped candle, I used Deli Paper. Once my monoprinted background was dry, I Black embossed the Leaves Background multiple times so the Deli Paper would fit around the candle. I taped the ends together, wrapped a piece of copy paper around the candle then using my Heat Tool, pressed down on the copy paper as I heated to push the Deli Paper into the hot wax. To embellish I wrapped Burlap and Ribbon around the center, then added some mono printed fall leaves that were Black embossed using the Autumn Blessings set, the die cut and embossed them using the ODBD Custom Fall Leaves and Acorn Die. Further embellished with a Olive button tied with Twine. The frame was cut from Kraft card stock and a monoprint panel I created to coordinate with the candle, using the Silhouette Cameo. I Black embossed the Leaves Background on the monoprint panel. The quote is Black embossed on the Vanilla panel for the inside of the frame. To embellish, I added leaves from the Autumn Blessings stamp set that Black embossed and die cut/embossed from scraps of the monoprinting. To further embellish, I added a leaf swirl die cut from Olive card stock using Our Daily Bread Designs Fancy Foliage Die, Twine and buttons. Kelley will randomly be selecting 1 winner who will receive a $50 gift certificate to Our Daily Bread Designs, good towards the purchase of ODBD stamps, just for commenting on the Design Team cards! You have until Wednesday, October 2, 2013 at 9:00 p.m. EDT to leave your comments. The Winner will be posted October 3rd, on the Our Daily Bread Designs Blog, so be sure to check back there to see if you are won! That is such a pretty set! Love the beautifully decorated candle! What an awesome set!!! Love, love, love!!!!! Super creative and gorgeous!! HUGS!! Wow, Lisa! These are really awesome projects! I love that candle. 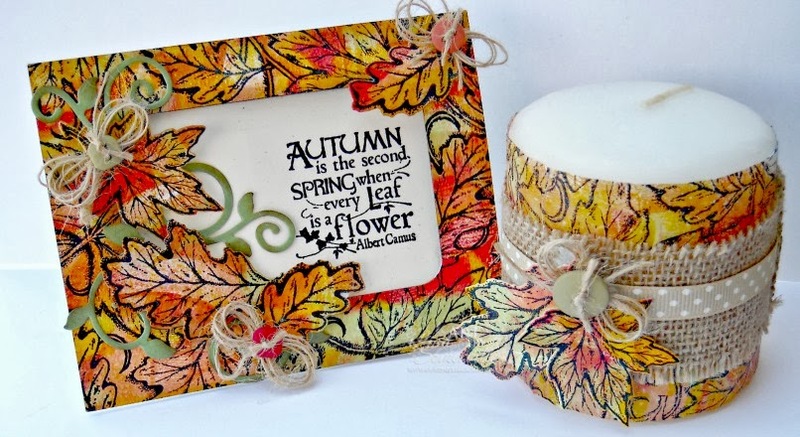 Wonderful fall projects, Lisa! Love the colors and all the different items you created w/ them. Super job! Beautiful and colorful! I love the colors of Fall- fabulous! What a stunning set Lisa!! I just love your fall colors!! So vibrant and beautiful!! Awesome projects! What an absolutely gorgeous gift set!! Love the vibrant colors and all the details!! Super duper creations!! Love the card & matching candle set!! What a great gift idea! Gorgeous home decor projects Lis! I love the idea of the deli paper instead of tissue! I have never tried that but it makes so much sense! 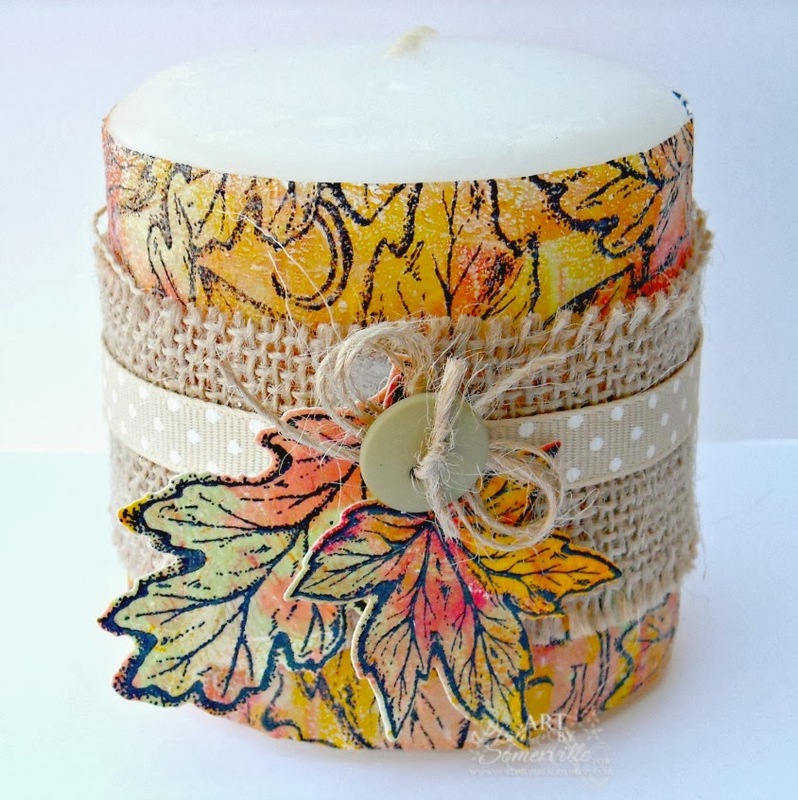 Love the way it came out on your candle, and the burlap wrap is perfect. The frame is beautiful too! 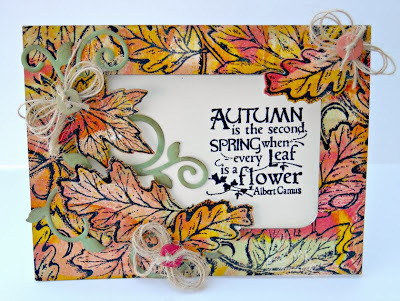 Love what you did with your Gelli, the colors are outstanding for Fall, and the leaves are perfect. Great idea with the candle and deli paper, how did you like using it? I don't care for it, but you handled it like a pro!! 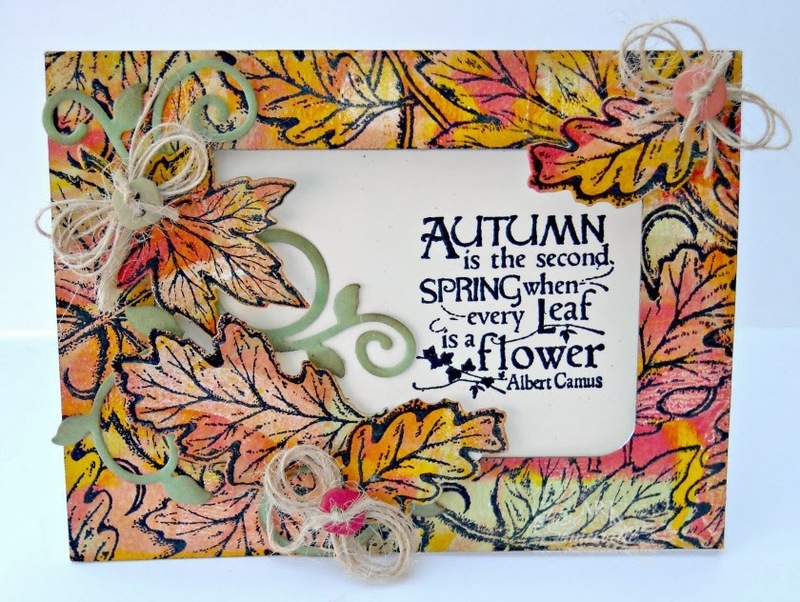 Gorgeous and colorful Fall projects. I really like how you did the leaves. Lisa what an amazing gift set! I just love the fall colors and the burlap!!! That candle is so beautiful!! I have not tried embellishing a candle yet, but this one is so inspiring! I might give it a try. Beautiful card and candle. You did a fantastic job on both. I love the button and twine. Such a handsome Fall projects! Love the rich colors you achieved w/the gelli plate as well as beautiful textures surrounding the frame and candle! beautiful set!! love your background paper too!! great ideas love the candle!! what a lovely set! genius to wrap the candle!! love it! Great ideas for decorating our homes for the season. What a gorgeous gift ensamble, Lisa! Your leaves are so vibrant and beautiful, and the candle is just stunning! I always love seeing which techniques you will use on your projects! Hugs! Beautiful set! I like the idea of black embossing first. Will have to try that. How beautiful! The candle looks just amazing - it's something I still haven't tried yet. I love the soft, slightly distressed look that the white adds to those glowing autumn colours. such pretty decorating ideas here, would make lovely gifts! Wow, Lisa, these are both so fantastic!! The frame is so pretty and the candle is awesome! Love the idea of the deli paper! !